Joint – A regular style joint. Pinner or Pin Joint – Thin personal joint. “L” Joint – 2 papers, one cut in half and glued to make a longer joint that is thicker on the end. Inside Out or Back Roll – Glue side down, wrap around once and burn the excess paper. Makes a healthier, less carcinogenic joint. Spliff – Tobacco mixed with cannabis. Dutch Tulip – Large cherry made with two papers glued together and then folded and glued again to make a triangle. Then opened up and filled with cannabis to be tied to a cardboard for smoking. Cross, or Holy Cross – Famed by the movie “Pineapple Express” is a 3 headed joint that a hole is cut to meet up with the lead cardboard and wrapped with paper glue to stay in place. Windmill – A reusable cardboard cylinder that is wrapped with paper and closed at the top with paper. For joints stuck into the large cylinder. 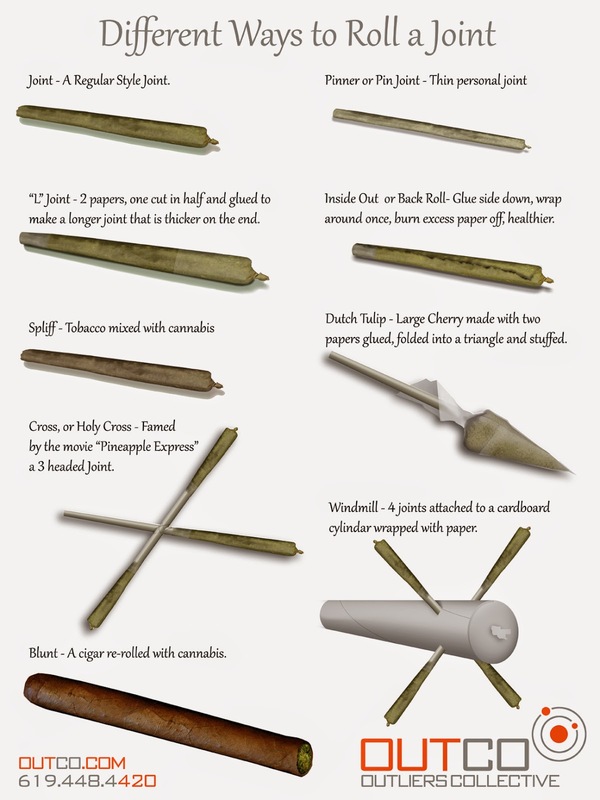 Blunt – A cigar paper re-rolled with cannabis.